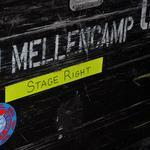 John Mellencamp holds a distinct station among chroniclers of the modern American experience. As has been borne out in nearly four decades of songs, more than 20 of them top 40 hits on the Billboard Hot 100, the lexicon of his story telling is that of the farmer, the small town purveyor, the boundless spaces sprawled between the headlines. But don’t expect him to expound much on that ethos, or even take credit for his role in giving voice to topics that have inspired all stripes of social activism, including Farm Aid. As the Grammy winner, member of the Rock & Roll Hall of Fame and ASCAP Founders Award honoree prepares to be inducted into the Songwriters Hall of Fame on June 14, he tells Billboard his songs always choose him, and he’s more convinced than ever the barometer he continues to hold up on new album Sad Clowns & Hillbillies is misunderstood by the majority of his audience. When you were inducted into the Rock Hall I was taken with your comments about your role as the guy who just keeps pushing the boulder back up the hill. Yes, I do see myself as Sisyphus. You’ve said many of your songs are more relevant now than they were when you wrote them. How did you have the insight to write, say, a “Jack and Diane” when you were in your early twenties? If you write about the smallest common denominators of life, they will always be relevant. Your songwriting has always shined with vivid storytelling. From where are you drawing current inspiration? Starting in 1985, I relinquished listening to myself and what I wanted to write about. I am open and do not try to direct the topic or the spirit of any song I write. Do you feel your lyrics are truly heard and understood by your audience? No, I do not feel they are understood by the majority of the audience. You would think with 7.5 billion people in the world, one person would take the time to sit down and listen to the words of my songs and read between the lines. For your latest album Sad Clowns & Hillbillies you teamed with Carlene Carter. What was that experience like? Carlene Carter and I have a wonderful working relationship. It’s like writing with my sister. It’s like performing with my sister. The new album seems at its core to be about a spectrum of struggles. Can you share the songwriting process this time around? I do not pick what I write about. It picks me. I’ve never sat down to write a song about struggle, or happiness or love. I only write what is sent to me. When you guested on The Late Show in February you took a knee during your performance of “Easy Target.” What was the significance of that moment for you? I’ve never planned anything in my life. Taking a knee felt like nothing. At the time, it felt like part of the performance. After the fact, I hope it made some kind of difference.